Just 44 hours after the impressive win against Arsenal, speculation was rife on how many changes would be made, as it turned out there were only two, Tadić and Romeu came in for Ward-Prowse and Clasie. In the West Ham line up they had ex Saint, Antonio. 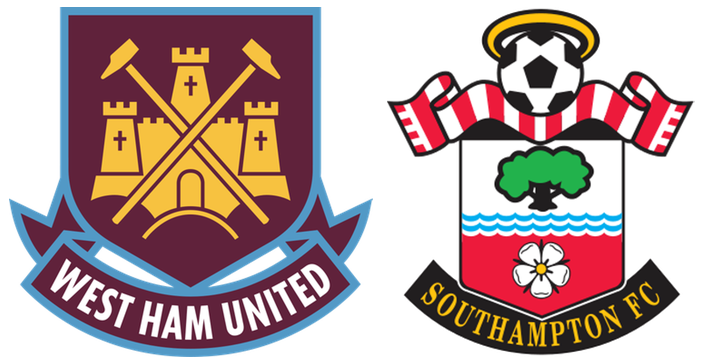 Form-wise from the previous eight games, saints had got ten points, West Ham just six points, so a difficult one to predict. West Ham started the most positive of the two sides, with two decent attempts in the first 10 minutes, however Saints with their first attempt scored after thirteen minutes. Shane Long put a dangerous cross in and the ball ended up in the net, Tadic claimed the goal, but I believe it went in from the West Ham defender Jenkinson, but it was 1-0 to Saints, so I don't really care. After the goal, Saints totally dominated the game, West Ham struggled to get the ball out of their own half, Long, Fonte, Mane and Tadic all had great chances to increase the lead before half time. At half time I had a text from my cousin (a West Ham season ticket holder) who couldn't believe their luck at being just 1-0 down, he at that point would have been happy to take that score at full time! obviously the West Ham manager Billic had other ideas and made two substitutions, he brought on Carroll and Lanzini for the very poor Song and Zarate. Second half started, West Ham blew two early chances, the look of panic came across Saints, but they soon regained their composure, until a freak moment when Wanyama made a great tackle in the box. Unfortunately the ball hit Antonio and the ball looped over Stekelenburg into the net for West Hams equaliser 1-1. Saints took off Martina and bought on Yoshida. West Ham were now in control. Lanzini shot wide and Carroll was unlucky not to get a penalty. Saints then brought on Ramirez and Juanmi for the last twenty minutes of the game, but they had very little effect. It was no real shock on eighty minutes when, after Antonio hit the crossbar, Carroll had the simple task of scoring an easy header for West Ham to take the lead. After that Saints had a lot of possession, but without ever looking like getting a goal back. A very disappointing 2-1 defeat, after being so dominant in the first half. Like so many games this season, we have failed to take early chances and have been punished. We panic when put under pressure and our heads drop when we concede. It seems a total attitude thing. I'm now left wondering how different it would have been, if Arsenal had scored an equaliser when the score was 1-0 the other night.